It’s time to suit up for a virtual trip down memory lane as Twentieth Century Fox Home Entertainment launches the ultimate destination for “How I Met Your Mother” fans and a chance for them to take home some of the most iconic props from the show’s nine season run. Over the course of the next five weeks the all-new HIMYMProps.com website will feature props you can enter to win each with an official certificate of authenticity, including such unforgettable items as “Robin’s Vancouver Jersey,” ”Ted’s Hot Dog Costume,” “The Goliath National Bank Hard Hat,” “The Parking Meter” ripped from the street by Barney's father and many more surprises. One lucky fan will have a chance to win the ULTIMATE prize – the actual bar from MacLaren’s complete with bar stools! That’s not all. Tune-in to the site each Monday night at 8:00 PM EST / 5:00 PM PST through October 20 for the “Flash Sweepstakes,” which gives fans a chance to win one amazing prop within a limited three-hour window of time. The first item up for grabs on September 22 is the “Robin Sparkles Pink Boom Box” from Season Two featured in her infamous “Let’s Go to the Mall” music video. Show creator Craig Thomas added, “We hope that you treasure and enjoy these beloved pieces of “HIMYM's” soul, or that you at least don't sell them on eBay." The HIMYMProps.com website allows fans to revisit some of the most recognizable and memorable items from the first two seasons through images, shareable memes and interviews with prop master David Baker and costume designer Reiko Kurumada. Simply find the props that say “Win Me!” on the site and enter for a chance to take them home. First up, fans can enter to win “The Great Lakes Plates” hand-painted by Marshall’s mom from Season One, with the site being updated each Monday with more props and items for fans to learn more about and potentially take home! A complete schedule of when the site will be updated can be found below. 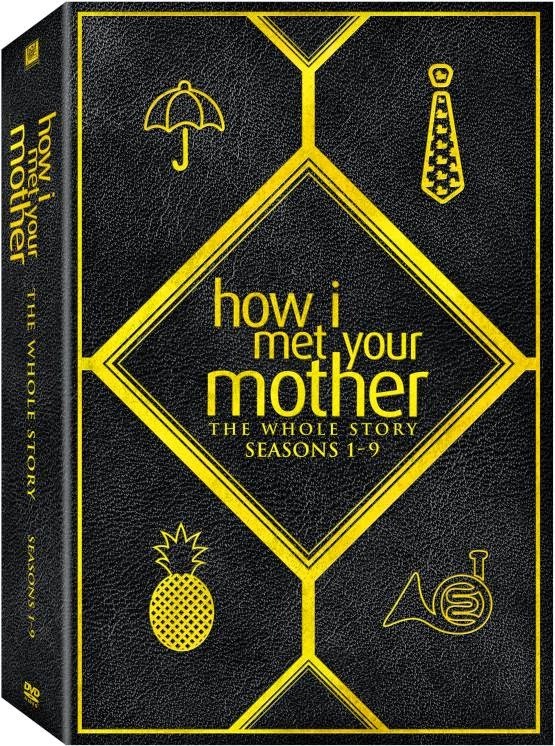 With its limited-edition Bro Code Playbook packaging, “How I Met Your Mother” - The Whole Story is available September 23 and makes the perfect gift for the holidays. The collection includes all nine seasons of the Emmy® Award winning show along with the show’s alternate ending fans have been eager to see. A brand new bonus disc comes loaded with featurettes including a complete series retrospective documentary of the series, a piece focusing on the casting of the infamous mother, a look back at how the Mosby kid sequence from the finale was shot back in 2006, the San Diego Comic-Con introduction and panel from 2013, a live table read of the touching series finale and an in-depth look at “The Pineapple Scene” where the mystery of the pineapple is FINALLY revealed!